To find a way to the public was never as easy since the existence of the internet. At the same time, it has never been as difficult as today to get an audience for your messages. After all, we are around on various media, and target groups can’t be limited to single types of media anymore. Modern marketing has to be trans-medial therefore – storytelling is ideal for that. By telling a story messages can be transferred and conveyed beyond medial borders. Messages are received more emotionally from a story and stay in one’s memory better. But also the story teller is forced to focus themselves on the things that matter. Thus, companies and organisations always find their own core by telling stories. 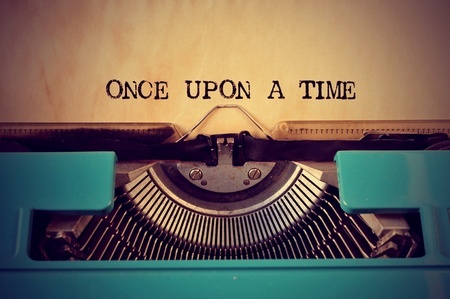 Storytelling therefore is a core essential for content marketing and Onpage SEO. The seonerd and his Berliner SEO agency have summarised the most important for this topic, the infographic can be downloaded as PDF at the end of this article. Storytelling can do a lot for companies and organisations in terms of search engine optimisation. With the right stories you can increase your popularity and build trust and closeness to your customers, employees and suppliers, and ultimately strengthen your own identity as well. What stories make stories seems to be so self-evident to us all that it doesn’t seem worthy to prod at it further, at first glance. Storytelling – what belongs to every story? “Hey, what are you up to?” The chickens answer: “We lay eggs. It brings joy to the farmer!” „Hm“, the zebra thinks and moves on. You don’t find that funny? Of course you don’t! The joke is missing the punch line. But there are also fans of this kind of jokes. The punch line for them is that they are telling a joke but are missing a joke. That only can be done because every part of a joke/story is told except the punch line. Like every story, to every joke there’s a beginning that introduces one into the story. A zebra on a farm? How does that work? One might want to know how it is continued. The core of the story follows, the actual event of the story. In this case it is a conversation. In a “true” story, however, the hero of the story would be in front of a task or a challenge by now. In our joke, on the other hand, the denial of the punch line is signalled, as there is not even a challenge for the hero. Accordingly, an ending to the story is missing. The hero, our zebra, has not lost anything and hasn’t won anything either. There is no consequence that can be drawn, which is normally the case in other stories. These three steps are ideally interwoven with a common topic. In our jokeless joke could be the topic “wasting time”. The joke is about how animals spend their time on a farm, after all. In this perspective, you can even see a touch of sense in this joke: the zebra can’t make use of the chickens’ activity. It can’t lay any eggs. The “hm” of the zebra could be referred to that, but can also be meant, that it has no interest to please the farmer and finds the thought alone peculiar. The topic of a story drives the main character, after all. In “The Lord of the Rings”, the topic is power. Frodo Baggins learns that even small, seemingly insignificant hobbits as he is can change the course of history. Good storytelling usually gets its power from not losing its focus on its topic. Whether in “Lord of the Rings” there’re trembles, love, celebration, renewal or destruction – everything happens from the influence of the ring standing for power. In other words, that also means that if you want to tell a story you have to be clear about the topic. Storytelling always forces the teller to focus. Companies and organisations can be directed through stories to what is really important to them. The story of a company, a product, a service, etc. can only be told tensely if the company or organisation knows the suitable topic. Actually, Pfizer was looking for a substance against coronary heart disease. The developed substance Sildenafil for that was supposed to relax the vessels in the heart. The tests were disappointing. Nevertheless the male test participants were enthused by the substance. Some even broke into the labs to supply themselves with the substance after the study was terminated. The reason was simple: the substance helped overcome their problems. Pfizer recognised this and brought Sildenafil under the famous name on the market. The topic of this story is “Pfizer helps”. If Pfizer had been really looking for a substance for this weakness the topic wouldn’t have been told half as beautifully. But this way out of an error an opportunity rose. And out of this business idea that some find indecent a story developed that sometimes you have to do something although you wanted to do something else. Altruistic, no? … greater popularity. Stories are emotional and often like to be shared therefore. preventing whale hunting stand for the impulse to act that every single one can change something. The story has to fit the target group. The topic has to be interesting for them and be told in a way that the target group is interested in it. Unfortunately, A generally valid recipe for that doesn’t exist. On the other hand what can be helpful is observing the target group and of course, the courage to make mistakes when trying as well. likeable and positive light, however. Young people could immediately identify themselves with the three guys, hence facing the wrong behaviour being addressed. Not only the target group has to be addressed appropriately, but the company or organisation telling the story must fit the story, as well. If a brown coal power plant wants to tell a story about flowering meadows that can go horribly wrong. Telling stories always also means to focus on the very own core. Only if you are authentic you can win over others for your story and ultimately for yourself and be successful in marketing. Storytelling is a good way to promote products, messages, companies or organisation beyond medial borders and bring them into people’s memories. The stories should always consist of an exciting beginning, a challenge that has to be mastered, and a conclusion, a lesson that can be drawn from this story. Telling the story will only be successful if you focus on the topic. This topic should be relevant for the target group and be presented in a way that the target group recognises it as relevant. The target group should also be addressed in a positive self-image. Since storytelling is always bound to the teller, the company or the organisation the story should be authentic, credible and understandable all the time. Download the infographic as PDF. 2. Storytelling – what belongs to every story?